Rather than leave stupidly early from Pravets to get an early flight on Sunday, I decided to leave the following day, which meant staying over in Sofia for a day. Milena dropped me off at the hotel and I spent the rest of the day in my room on the computer. The plan was I would be able to get loads of sleep and wake up at 04:00 to leave for my flight. The reality was I stayed awake until about 03:30. I don’t know why, but I just couldn’t sleep. There was nothing wrong with my room, but for some reason sleep didn’t come until ist was too late. At 04:00 my alarm went off and I felt like I had been kicked in the head. It might have been better to not drift off just before my alarm. I got cleaned up, packed the last of my stuff (including my laptop charger this time) and headed down to check out and get the shuttle to the airport. The airport was pretty busy. I couldn’t do an online check-in as my ticket was KLM, but the first leg of the trip was Bulgarian Air, so I had to queue at the check-in and bag-drop area, at the entrance to the gates, at security and at passport control. The queues were quite big, but moved quickly, so it wasn’t a problem. 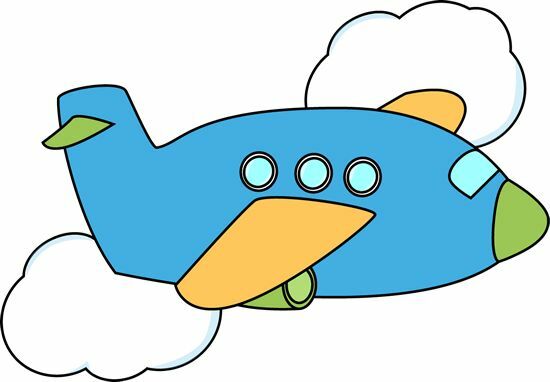 The flight from Sofia to Amsterdam took about 2.5 hours. We were a little late, but the gate for my next flight was close, so it wasn’t too much of a worry. Thanks to the folks from DXC for asking me to come across and spend the day with you before the conference. 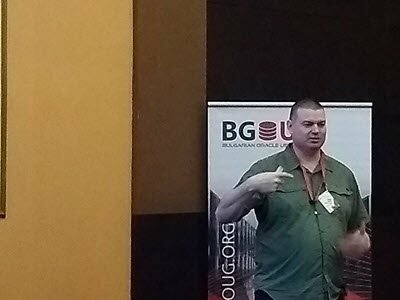 Special thanks to Milena and everyone else from BGOUG for inviting me and making everything go so smoothly during my 7th visit to Bulgaria. Thanks to all the attendees for making this such a friendly event. I paid for this trip myself, but I would still like to thank the Oracle ACE Program for letting me fly the flag. So that is my 7th BGOUG event over. I’m looking forward to number 8. See you all soon! After that I went back to the room to finish off the blog post about the previous day. Then it was time to start the day proper. Next up was Joel Goodman with “Oracle Database 12cR2 Application Containers”. We chatted before the conference to make sure our sessions didn’t overlap too much. I like going to see other presenters covering similar topics to me. It’s good to see how they approach the topics and to get their opinions on a feature. Next up was “Oracle Compute Cloud vs. Amazon Web Services EC2 – A Hands-On Showdown” by Ahmed Aboulnaga. This was another session where I was getting someone else’s view on a subject I present about. 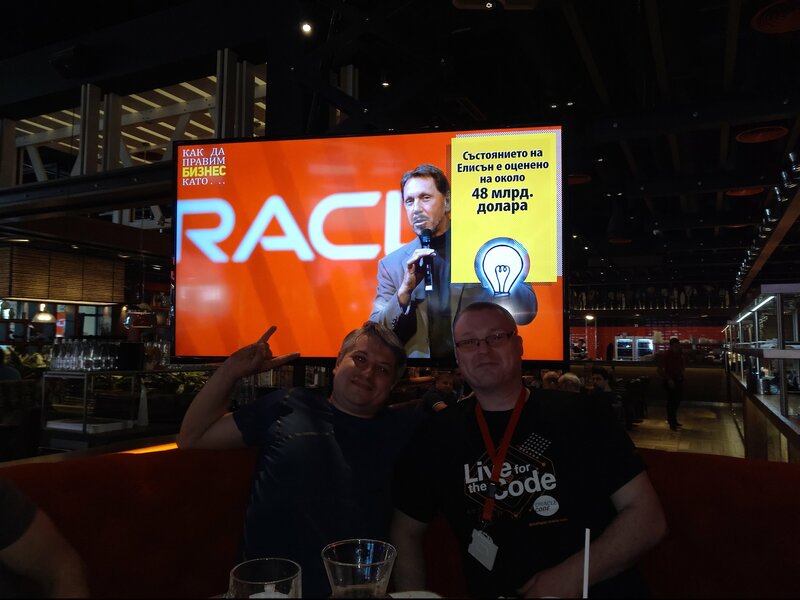 It was interesting to hear his views on the differences in pricing and maintenance of the two providers, and their move from AWS to Oracle Public Cloud. I got talking to Bryn at lunch and someone said, “Don’t you have a session in 2 minutes?” Quick dash to the room and it was me with “Put your feet up and take a REST. Take a tour of JSON support in the Oracle database”. From there is was off to get some food and do more chatting. I got to have a longer chat with Julian Dontcheff, which was really nice. We have known each other since our days answering questions on DBASupport.com, and we always speak at events all the time, but it was good to spend some more time with him. Gradually the food and beer took its toll and I switched into hibernate mode, so I said my goodbyes and went back to my room. PS. It seems I pressed publish when this post was half-written. Whoops! Day 1 started with far too much for breakfast, followed by trying to rehearse a new presentation as my laptop complained about having no power. 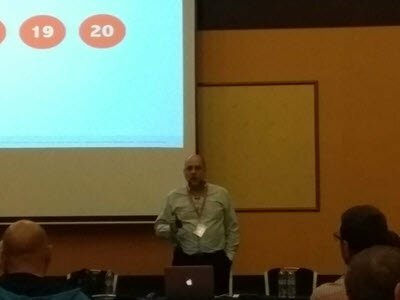 The next session I went to was Julian Dontcheff with “45 most useful new DBA commands in Oracle 12.2″. I like sessions like this that act like an index of new features. A load of pointers to remind me what I should be learning. 🙂 There is so much in 12.2 it’s both fun and depressing rolled into one. So much to learn and so little time. 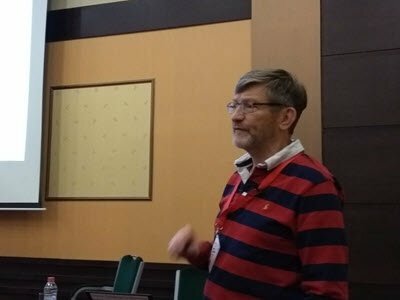 After lunch I went to see Giuseppe Maxia with “A quick tour of MySQL 8.0 roles”. This was really useful for me. There are some similarities to roles in Oracle, but also some really important differences too. I have been looking forward to this new feature, and this session will definitely save me time and some headaches when using it. 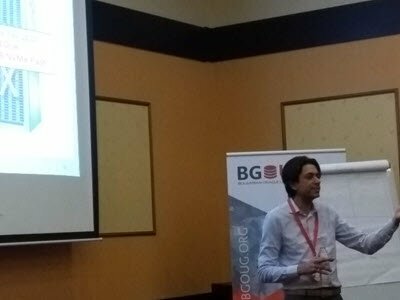 From there it was on to Ilmar Kerm with “Implementing incremental forever strategy for Oracle database backups”. This was based around Incrementally Updated Image Copy Backups, but included some custom stuff they do with their storage. I’m always interested to see how people use the same tech as me, but use it in a different way. I can see how his approach may prove useful in a project I’ve got coming up soon. Interesting! At about midnight I turned into a pumpkin and went back to my room to bed!